Stuart Kennedy (left) rounds off the scoring as Aberdeen open the tournament with a 7-0 home win against Swiss side Sion. 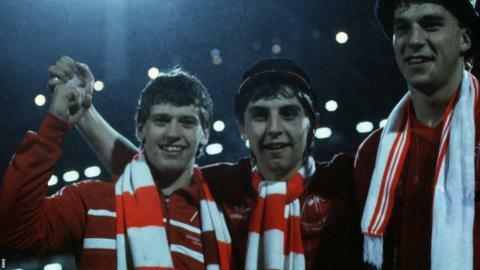 Mark McGhee scored twice in a 4-1 second leg win. 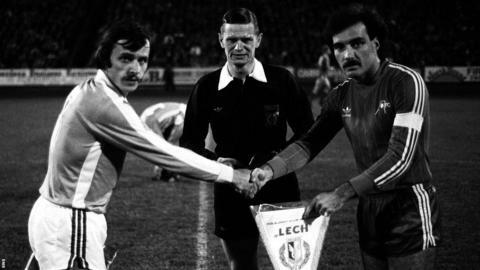 John Hewitt (centre) scored the only goal of the game against a stubborn Dinamo Tirana in the first round proper, with Aberdeen holding on for a 0-0 in Albania. 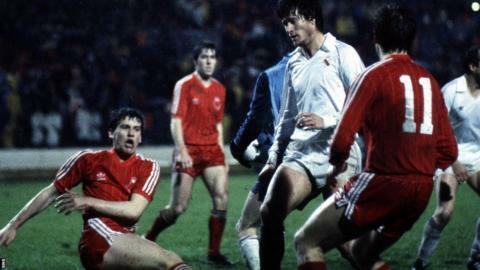 Polish side Lech Poznan were the next visitors to Pittodrie, with Mark McGhee and Peter Weir on target for the Dons. A Dougie Bell goal settled the away leg. 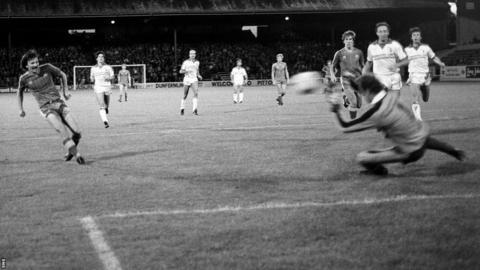 A quarter-final tie with the mighty Bayern Munich saw Aberdeen hold out for a 0-0 in Bavaria but the Germans established a 2-1 lead at Pittodrie. 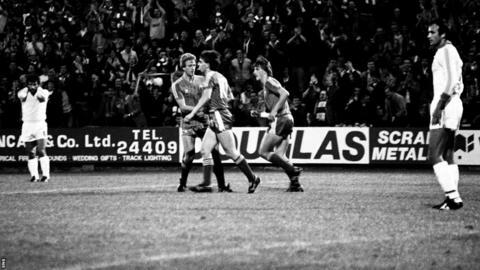 However, Alex McLeish thumped home a header from Gordon Strachan's clever free-kick to level the game on 76 minutes and John Hewitt knocked in a close-range rebound 60 seconds later to complete a remarkable victory. 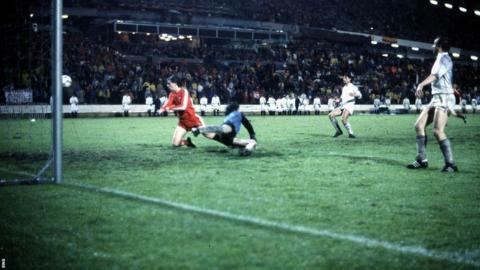 Mark McGhee forces the ball in from close range in the first leg of the semi-final against Waterschei. The striker scored twice as the Belgians were demolished 5-1 to set up a comfortable 5-2 aggregate success. 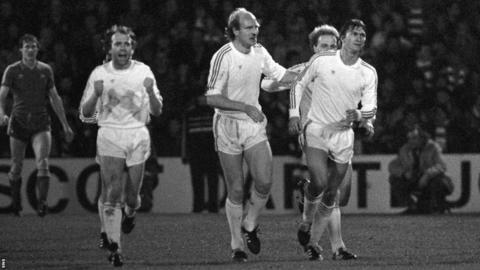 Close to 15,000 Aberdeen fans made the trip to Gothenburg's Ullevi Stadium for the final against European giants Real Madrid. 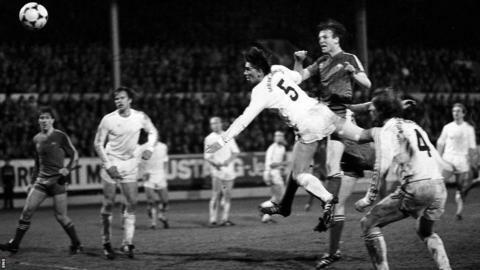 Eric Black (left) opened the scoring on a rainy night in Sweden before a penalty from Juanito levelled the game. With 112 minutes played, super-sub John Hewitt dives to head home a lovely cross from Mark McGhee. 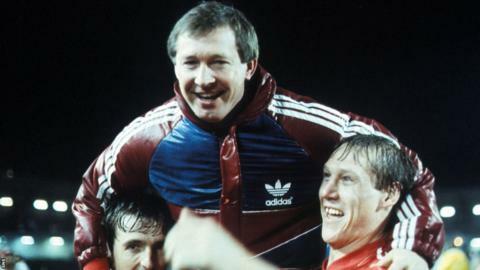 Dons manager Alex Ferguson joins in the celebrations at full-time. 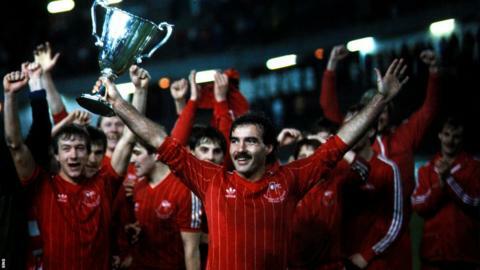 Captain Willie Miller gets his hands on the European Cup Winners' Cup trophy. 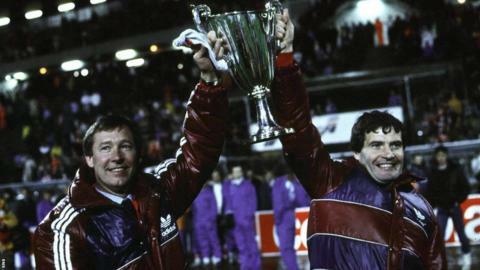 Alex Ferguson and his assistant Archie Knox show off the cup - one of 10 trophies the pair brought to Pittodrie.